You may need to enable this submenu by checking "Enable the 'Tools|Revisions' Submenu" in Options → Preferences, General|Features section. This menu item turns off both "Enable the Comparison of Revisions" and "Store All Revisions in the Document" options. 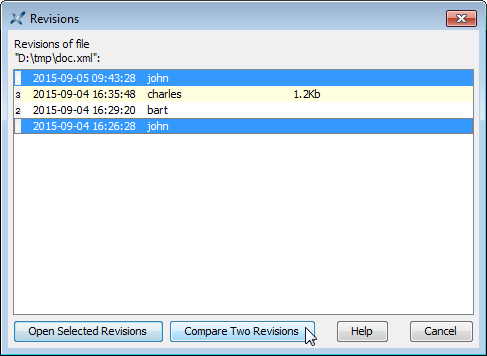 This option instructs XXE to add information to the document being edited in order to allow comparing two revisions of this document. Turn this option on if you need to compare two revisions of the same initial document. However, for that, you'll have to keep each revision in its own XML file. In practice, this option is useful only when your documents are stored in a CMS, a document repository, on a versioning file system (e.g. Google Drive) or more simply, if you often archive copies of the XML sources of your documents. This option instructs XXE to start storing all the revisions of the document being edited in the XML file containing this document. Turning on this option implies turning on option "Enable the comparison of revisions". If all revisions are stored in the XML file, then you'll be able to use open them using Tools → Revisions → Open Revision and to compare them using Tools → Revisions → Compare Revisions. Turn this option on before sending your document to reviewers. Then, after using the the Compare tool to review the changes made to your document, turn this option off. Displays a dialog box listing all the revisions of the active document. This dialog box allows to select one or more revisions in order to open or compare these revisions. This menu item is disabled (“grayed”) when option "Store All Revisions in the Document" has not been chosen for the active document. This active document may be the document being edited (considered to be “latest revision”; opened in normal read/write mode) or an older revision of the document being edited (always opened in read-only mode). Displays the Compare tool at the left of the main window. The Compare tool will show you the differences existing between two revisions of the same initial document. It also allows to accept or reject some or all the changes. More information about what's needed to be able to compare two revisions of the same initial document using the Compare tool in Appendix A, Description of the XML differencing algorithm implemented by the Compare tool in XMLmind XML Editor - Commands. More information about how revisions are stored in the XML file in Appendix B, Format of the revision history in XMLmind XML Editor - Commands.